Stores Ref. 22c/1070. 'Overalls Flying, Lightweight, Packs, Back'. This is the backpack designed for use with the lightweight flying overall (Beadon Suit) which replaced the Sidcot suit in 1945. 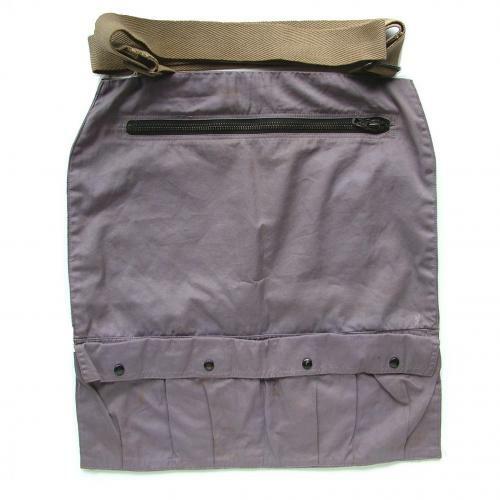 Made from the same grey 'ventile' gabardine as the suit and approximately 45 x 45cm with two adjustable webbing shoulder straps and various pockets - one of which has a zip fastening. The pack was used to carry rations and medical supplies etc. This example is in good condition bar light faded and some staining. Labelled. Quite a rare item to find. Stock code S17786.